Avengers: Infinity War was such a huge production thatAnthony Mackie didn't know Winston Duke was in the movie. In an exclusive interview with E! News' Sibley Scoles, actors Mackie, Duke and Sebastian Standiscussed filming and staying in shape for their roles. During the interview, Mackie, who plays Falcon, revealed how he found out he would be working on the film with M'Baku from Black Panther. "I didn't even know he was in the movie," Mackie said pointing to Duke. He actually bumped into the actor while in New York City, and it was there that they realized they were both going to Atlanta to shoot the film. Mackie then explained how unofficial everyone's last day was as the actors were asked back on set multiple times. "I literally wrapped three times," Mackie revealed. "I wrapped. Two weeks later, they were like, 'We need to re-shoot this scene.' A month later, they're like, 'We need to res-hoot this scene.'" 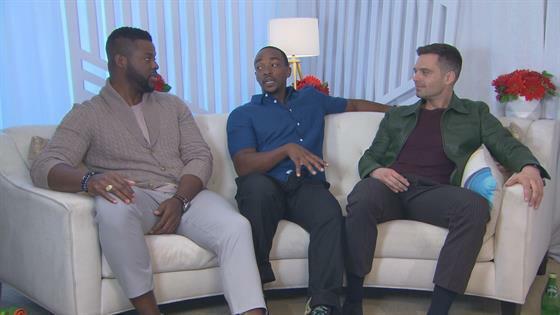 From there, the convo shifted to keeping in shape—and Mackie revealed that a few cast members have weird approaches to getting healthy. "Some of us do weird stuff like eat seaweed, wring out chicken breast, and get little packets of almond butter when they're about to faint," Mackie said, alluding to Stan. "I don't skip leg day," he added of his own routine. "Squattin' is my passion, not my purpose."